The CMO Council and partner, Lithium, will take an in-depth look at the findings of "Variance in the Social Brand Experience", a new initiative set to understand how marketers are leveraging social media marketing -- and the consumer reaction to this new digital engagement. Join Lithium CMO Katy Keim and CMO Council VP of Global Operations, Liz Miller as they present the findings from this comprehensive study of both marketing executives and social consumers and reveal what it means for social brands today. 1.Why and how consumers connect with brands in social media and what they expect from their social customer experiences. 2.How social media impacts marketing operations as brands explore and embrace emerging social channels. 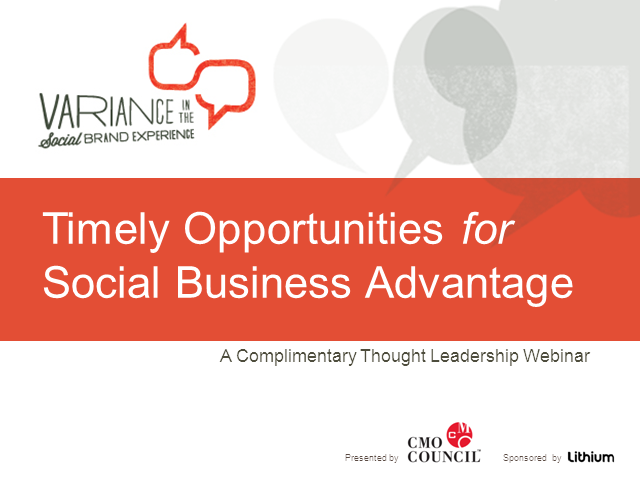 3.Prescriptions for how best to engage in today's social media marketplace for increased competitive advantage.